Evergreen shrubs which can hedge nicely... any ideas? Hey all. I live in Zone 7 and I just finished a building a porch and retaining walls in the front yard, creating a large planting area against my house. It's roughly 8x20, with some areas which are roughly 3' deep in front of the porch. In the large area I wanted to have shrubs and stuff so I don't have a full 160sq.ft. of flowers. Also, I want to give some coverage to the foundation because it's pretty unsightly. So, with that said, I'm thinking about doing two levels of shrubs; one taller to the back (4-5') and one smaller up front (2.5-3'), with a total depth of about 4-5'. What I want to do is get some pretty full, dense coverage. For the back row I'm looking at some Boxwoods or Emerald Gaiety (although I haven't seen any great pictures of larger Em. Gaiety hedges being shaped nicely)... and for the front row I'm thinking about the 'Fire Power' Nandina, to give some color in the spring and fall. I do have a small child (16mo.) and I read that Nandina are poisonous if eaten... and kids eat everything, so that is a negative point for the Nandina. I feel kinda limited as my trip to the nursery didn't give a ton of options... just a bunch of shrubs in tiny pots, but without knowing what they look like in maturity, it's hard to know which shrubs would look well together with. :[ So hard to decide and most of the 'search for plant' websites don't work very well... or maybe I haven't found (or paid for) the good ones. If you think there's something that would look good, I'm all ears... erm, eyes. Thanks in advance! what direction does your house face? What kind of sun exposure does your planting area get? The house faces west and get's a ton of sun in the late morning through evening hours. Actually, I think you have done your homework quite well and the boxwood and nandina are good choices. Other evergreens in your size range would include dwarf holly, dwarf yew, dwarf juniper. If part of the area gets a bit less sun, especially afternoon sun, you could do some azaleas/ rhododendrons. If the front row didn't have to be evergreen, it would open up a lot more choices: spirea, red twig dogwood, daphne, flowering quince, snowberry, summer sweet, dwarf viburnum. But your space even at the widest is crowding it for two rows of shrubbery. Might work if you staggered the rows. Otherwise, you might think about one row of shrubs with perennial flowers in front of them. You can choose a selection of bulbs and perennials so that there's something in bloom, pretty much from Feb to Nov.
One of my favorite designs that I do is to do two hedges like you are talking about doing with the hedge in the back being a consistant straight line (traditional) hedge. 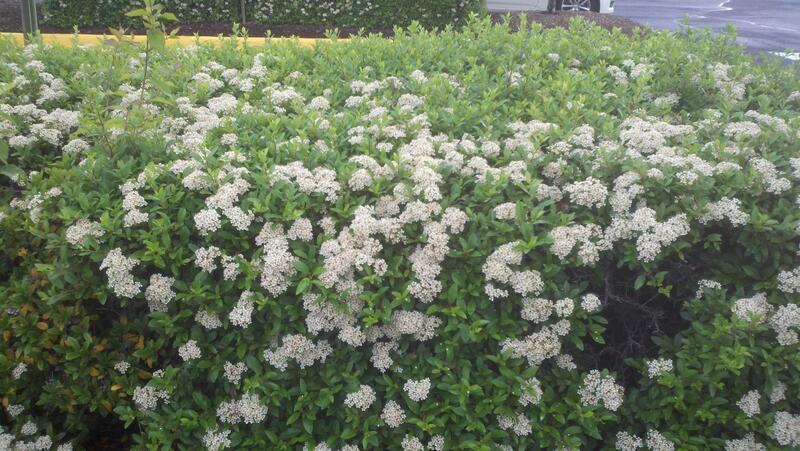 The shorter hedge in front is made up of different sized Boxwoods that are trimmed to undulate. I start out on the ends with 12" or smaller plants and gradually work my way up to 21-24" plants for the larger plants. I also tend to arch or curve the front hedge to add to the contrast. Nandina sounds like a good choice for your taller hedge, but a named cultivar would be preferable over the straight Nandina domestica as it is a bit less consistant that 'Sienna Sunrise', 'Sunray' and 'Gulf Stream'. I am glad to see the interest in Nandina. I bought three different varieties for a job today(the client loves the stuff) and I am so happy to plant it for him because I can be assured I won't have to replace a single plant. Nandina is the one plant that I can say I have never seen die! My neighbor has a couple Nandina in front of his porch and I really like them. They hold their leaves all year and, for whatever reason, I feel like they look very whimsical. I also love how they change colors with the seasons. Altogether a great looking plant. Using the NGA Plant Finder that Rainbow linked, it looks like the Gulfstream would reach the desired height... but with the slow growth rate, I'm just wondering how long it'd take. But Rainbow brings up a fantastic point which has kinda been sitting in my wifes head for some time... two rows of bushes would be crowding a bit. If I had a single row of larger evergreen plants (that I could keep trimed to be 'thin', depthwise) then I could probably get away with a smaller row of a groundcover shrub, like Spirea Magic Carpet or something bright and bold. Even then, that might get to be a little too much. The total depth of my shrub line I'd like to be 4', giving me some room to play with other plants. Then, I noticed this plant this morning and I'm really digging it... I just don't know the name, if it's evergreen, etc. I'll have a larger Aborvitae between the windows to help fill that void on the front of the house. Below the windows, I'll have a hedge of the Nandina "Gulf Stream", as it appears to be the tallest Nandina I could find. 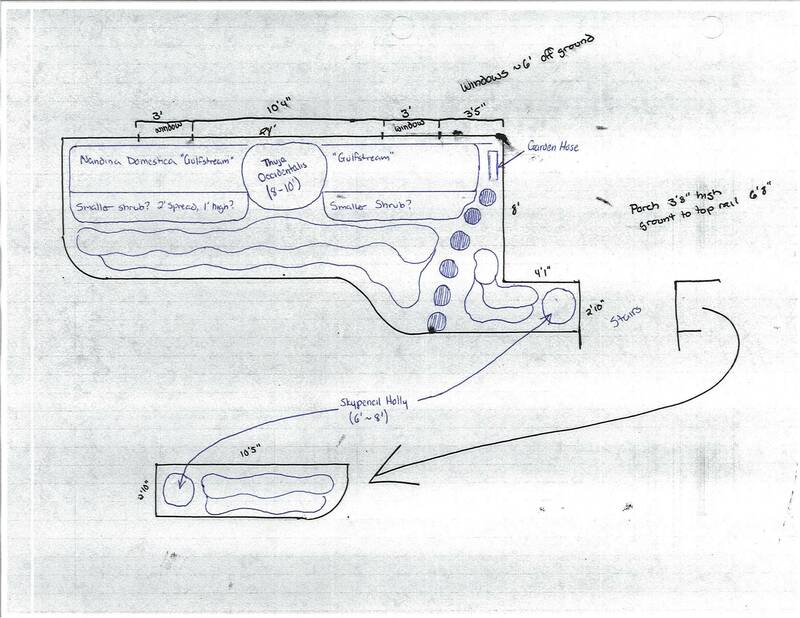 The Gulf Stream hedge will be kept within three feet of the foundation. In front of that, I'll have a small row of shrubs (Euonymus, Daphne or Spirea I'm fine with) or perennials (which I don't even know which types would look best). That's the big problem... what will look best? Next to the stairs I'd get some Skypencil holly and then throw some perenials and annuals in the rest of the areas. My wife and I have been overthinking this, I think. She and I have no idea how these plant combinations would look together. She said if we're going to spend over a grand on plants, spending $60 on some landscaping software might be worth it. Hopefully I don't need to go that far, though. So, If you could spend my money to make the nicest looking planter in the neighborhood, what would you do -- just short of hiring a designer and landscaping company. Check out 'Gold Elf' Spirea. It is a really good plant that you could use for your tiny hedge. The 'Gulf Stream' is a lot slower than the species and will allow you a more uniform hedge. You should expect less than a foot of new dense growth per year. The regular Nandina sometimes gets leggy and even top-heavy. I think your choices have been good so far. Your maintainance will be very low to boot. Almost forgot- your plant looks a bit like Viburnum x burkwoodii 'Conoy'. It's growth habit seems to be a bit off though. The plant you showed appears to have been sheered repeatedly, so it's actual shape is difficult for me to tell. Also there seem to be some wild growing shoots. Are those from that plant or are they weeds/other shoots from another plant?